Do you need to scan a list of URL’s and check for broken links? 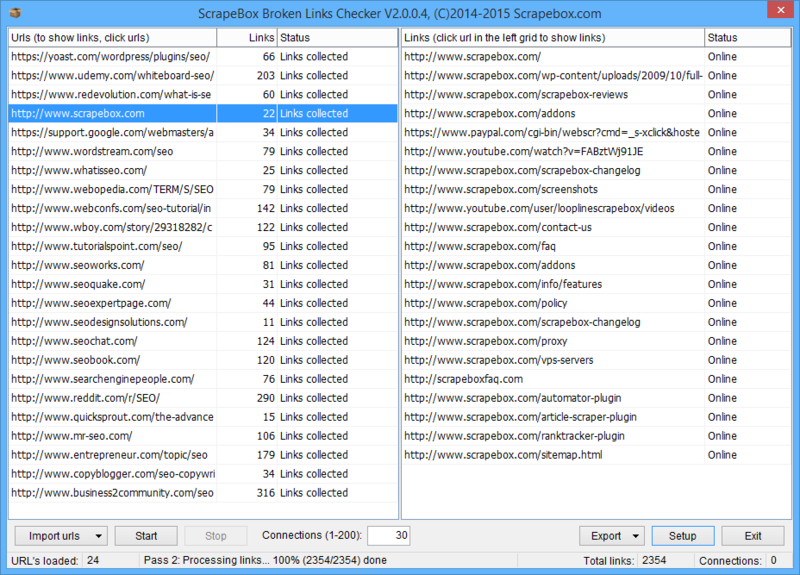 The ScrapeBox Broken Links Checker addon allows you to load a list of URL’s, the addon will then visit each individual URL in your list and extract all the links on each page. It will then visit and check each of those links to test whether they are Dead or Alive. The addon allows you to configure which server response codes should be classed as alive, for instance 301 and 302 redirects. You are then able to export all links and their status, or export all dead links in .xlsx format. Clicking a URL on the left side will show what links were extracted from that URL over on the right side and the status of each extracted link. This addon is ideal to audit your websites and detect broken internal and external links. It’s also a fantastic way to scan websites linking out to broken links, and contact them to offer your website as an alternate link. You can also scan high profile sites and find links to expired domains available to register. View our video tutorial showing the Broken Link Checker in action. This is a free addon included with ScrapeBox, and is also compatible with our Automator Plugin.